For those working in the Central Business District (CBD), I bet you can all agree that this is the most used phrase come lunch hour. Funny thing is, of all the areas in Singapore, I'd say that the CBD has the most food options from the quick and easy fast food joints to the very Singaporean hawker centres to the slightly classy restaurants and hipster cafes. Then again, with more options comes greater confusion on where to go for lunch every single day. Unless you're a create of habit like me who frequents her favourite places on a weekly basis to the point of being known on a first name basis by either the stall owner or the restaurant server, then choosing your lunch venue would definitely be a daily dilemma. Allow me to share one of my favourite restaurants with you in hopes that this will solve your problem. :) Hyang To Gol is a traditional Korean restaurant located inside Amara Hotel. I got to thank my friend A for taking me here not so long ago and I've actually been back so many times with different groups of colleague. It happened one lunch time when A and I agreed to meet up. We were initially supposed to have salad but since I was feeling extremely stressed from work that day, I told her that I needed to eat something good to cheer me up. She then suggested we go Korean and told me to meet here at Amara Hotel. I was really confused as I know all the Korean restaurants along Tanjong Pagar Road but I've never heard of the one inside the hotel. We went up the small glass lift that just connects the lobby up to the second floor. It's quite funny to have it there but whatever makes life more comfortable, right? When A and I got to the restaurant, we had to queue up for a few minutes. Wow, this place was popular! In fact, I saw tables of Koreans dining there. To me, seeing real Koreans dining at a Korean restaurant is always a good sign of the food's quality. The wait wasn't that long and I always enjoy chatting with A so I didn't really noticed how long it took for us to get our table. One might think that hotel restaurants can definitely be pricey but Hyang To Gol's lunch sets will prove you otherwise. 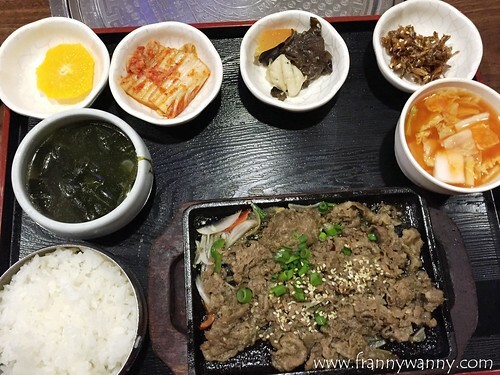 You can choose from a variety of barbecued meat (pork, beef, lamb or chicken) or seafood (squid or eel) done bulgogi-style to some comforting Korean soups, noodles or rice dishes. All lunch sets starts with a bowl of cold kimchi soup that I love love love so much. I don't know why but I find it very cooling and refreshing. Next comes the full set. Their lunch sets is served with 3 banchans (appetizer), 1 vegetable soup and a slice of orange. Regardless of whatever you get, you'll still have the same combination as your lunch companion. It's fine though as I really love the banchans especially when they have the salty sweet dried fish that's somewhat like dilis (anchovies). For the number of times that I've visited this restaurant, I got to admit that I tend to stick to just two choices which I would interchange every so often. First was the Beef Bulgogi (S$12.90) which I can boldly say is one of the best that I've every tasted not only in Singapore but even outside the country too. 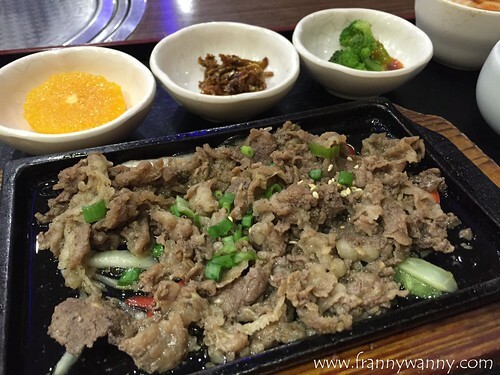 The sliced beef has always been so tender and I love dipping this in some sesame oil-salt mixture which I would specifically ask for every time I dine there. This was actually the first set that I was able to try and I would also recommend this to everyone who dines there. This is definitely a must-order. After a while though, I wanted to try something else apart from the Beef Bulgogi. Not that I got sick of it but rather, I wanted to check out if there's any other winning dish apart from my favourite. 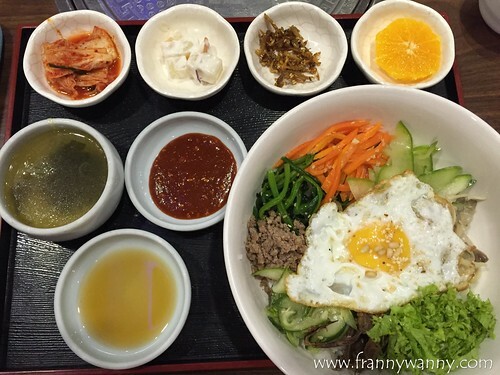 That's when I tried the Bibimbap (S$11.90). 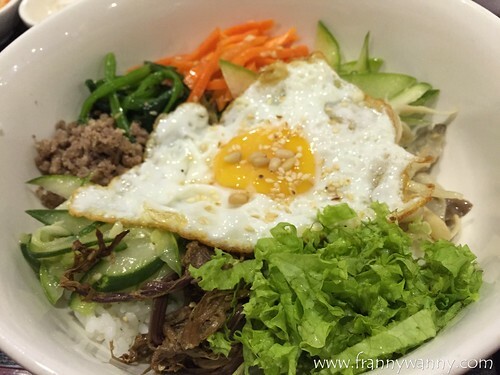 I've always been a fan of this traditional rice bowl which has a good portion of sliced vegetables and beef. This is one way to get me to eat veggies even carrots and what not as I would cover my rice bowl if lots of the salty-spicy bibimbap sauce (I think it's called gochujang if I'm not mistaken), I'd break the sunny side up egg and drizzle some sesame oil and salt before giving it a good mix. It doesn't look very appetizing as it can be quite messy but hey, it's really really good. Hyang To Gol's version is very filling as they're very generous with not only the rice but with every single ingredient. For only S$11.90, this is definitely bang for your buck. Imagine you got that huge rice bowl to finish plus all the banchans and dessert too. I actually had this again for lunch yesterday and I tell you, it filled me up all the way till dinner which was at 9pm. As much as I love discovering new places, I actually find greater happiness in being able to take friends to try my favourite restaurants too. I guess, this is why I've been blogging all these years in hopes that I can help you in times of need to answer the dreaded question -- "Where should we eat?" Visit Hyang To Gol at 165 Tanjong Pagar Road, Level 2 Amara Hotel, Singapore 088539. Call them at 6220-7160.